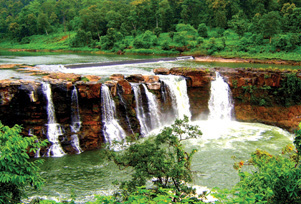 Gujarat counts numerous waterfalls amongst the natural features that define landscapes. Some of them are known as historical landmarks while others create an aura around them. One look and travellers will bind to be transfixed for hours. Gira Falls gets the limelight when one talk about the waterfalls in Gujarat but there are many other that are among the continent's least celebrated, most under-appreciated natural wonders. Shankar Waterfall (Dharampur), Chimer Fall (Songadh), Zarwani Waterfall (Dhirkhadi), Ninai Waterfall (Narmada district), Shiv Ghat (Ahwa), Barda Waterfalls (Chankhal) and Jodiya Waterfalls (Bilpudi) are some striking waterfalls of Gujarat where the one can see freshwater marshland. People who love the noise of gushing water should make their way to Gujarat. Might not be the tallest, however, Gujarat has a bunch of beautiful waterfalls. Best season to see waterfalls in Gujarat is the months of monsoon as they all are in its full glory. One can easily spend a day gazing at the gushing waterfalls and soaking in its natural beauty. Plan a trip to Gujarat to embrace the pristine beauty of nature.